In April, the Creative Youth Initiative will celebrate 20 years of using creative expression as a tool for positive change in the lives of young people. Museum of Creative Hearts will showcase selected works from past and present students, and celebrate the collective stories of students, staff and supporters from 1993-2013. 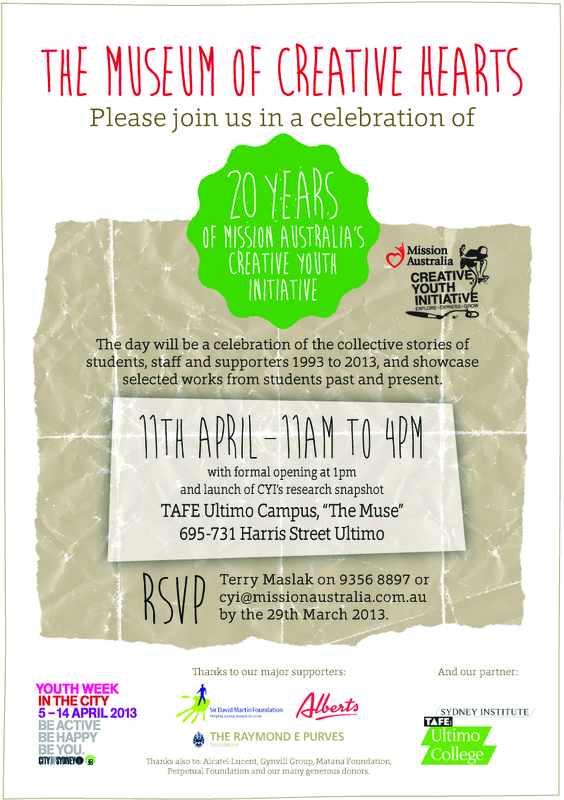 The Mission Australia youth initiative has two core programs, ARTWORKS! visual arts program and Sound of the Street (SOTS) music program. A third and critical element of the initiative is the Student Support Coordinator, a social worker who provides individualised social support to students including ongoing assessment and case management throughout the course. Offering a free 20 week course, programs run three days per week and are TAFE Outreach accredited; students who complete the course receive a Certificate 1 in Access to Work and Training. Funded through corporate sponsorship and private donors, CYI cites The Sir David Martin Foundation, The Raymond E Purves Foundation and Alberts Music as major supporters, also Alcatel Lucent, Gynvill Group, Matana Foundation and Perpetual Foundation. “From here on in you’re an ‘artist’ or a ‘musician’. Leave your labels at the front door – anything others have called you, or that you tell yourselves”. That’s the first thing participants of the Creative Youth Initiative are told, an important first step in creating powerful change for young people who have been referred to the strengths based program for a range of reasons, but commonly having been coined ‘at risk’. Targeting young people aged 16-25 years old who face challenges including homelessness, mental health, substance misuse, family breakdown, unemployment, social isolation, gender identity, bullying and poor educational experiences, the program has no catchment area and students travel across Sydney to the unique program at the Mission Australia Centre in Surry Hills. “I loved music and drama, but the public school system just wasn’t for me. I’m pretty sure the motto for most students at CYI is ‘I would’ve done great in school had there been no teachers or students’. So my career advisor suggested the SOTS program. She knew I loved music and thought that it would be the best place for me. I jumped at the idea – of course I would’ve done anything to get out of school at that time. Little did I realise the profound impact this course would have on my life”. Young people are referred from a range of services including youth and community services, counselors, juvenile justice, supported accommodation services, schools and TAFE – they may also refer themselves or can be referred by their families. Demand is high, with referrals almost three times the number of places available (14 art, 10 music per 20 week course, run twice a year). Potential students are not required to have an existing background in either music or art, although the degree of that experience varies widely; more important is their commitment to the course, with the responsibility and discipline required impressed upon students from the outset. Sometimes a young person may be prevented from undertaking the course as their current situation is too chaotic, although this is entirely dependant on the individual; one young woman moved between eight crisis accommodation centres during her course duration – the program providing her only sense of stability. “I wasn’t too sure what is was going to be like when I first started. It turned out to be the best thing I’ve done”. Starting with an initial assessment, CYI’s Strengths Based Approach encourages the young person to start thinking about positive change and how they can work collaboratively to achieve it. Miller smiles as she explains that initial assessments commonly see new students describing themselves as ‘lost’, ‘different’ and feeling they ‘don’t fit in anywhere’; she knows they’re in the right place, and that they’re not alone. A tool called the Rickter Scale, helps Miller and the student identify where the young person perceives themselves to be – and where they want to be – in relation to a range of life domains. The tool which looks much like an abacus, is designed to remove the focus from the ‘interviewer’, engaging the user to help build rapport – particularly useful in working with a client group who are often not comfortable with, or used to verbalizing what’s happening for them. The tactile nature of the scale is also particularly useful in creating a non-confrontational environment and a non-verbal dialogue in a situation where the student may have high levels of anxiety or an autism spectrum disorder such as Asperger Syndrome. Students are closely supported with meeting their current needs and future goal planning, referrals to further education or services and community integration. A plan is developed for how comprehensive support can be provided throughout the course including assistance with e.g. Centrelink, housing and working with a young person’s case manager. A mid-term review sees students revisiting the Rickter Scale to look at how and why goals have been exceeded or missed, also to start the process of exit planning – a major aspect of the Student Support Coordinator role. Using the momentum developed throughout the course, Miller works intensively with each young person to develop referral pathways including to school, short courses, TAFE, university or employment. ARTWORKS! and SOTS are not therapy as such, instead described as ‘music and art in a therapeutic environment’. Once the young person feels safe, personal issues invariably arise as part of the creative process, appearing in lyrics or drawings. The Student Support Coordinator works outside of the studio setting with the young person at this point; having developed a relationship, students actively engage with her for support. Art and music become conscious coping strategies and learning how to use their creativity is transformational; program evaluations demonstrate that practical art and music skills become a by-product of the students’ personal growth and development of internal resources. The visual arts program explores a range of mediums including painting, sketching, printing, aerosol art, life drawing and sculpture. Materials, one-on-one and group tuition are provided and an annual exhibition is the goal students work towards; with their work for sale, students are often then commissioned to create artworks for a variety of end uses. The music program boasts four recording studios and state of the art equipment; students are taught relevant software, the basics of songwriting and how to create original songs. With a focus on developing a practical understanding of the music industry, students’ work is included on a professionally mastered end of year compilation and performed at an annual album launch. The two tutors in each program are either performing musicians or exhibiting artists – inspiring and relevant role models. Inter-group meetings, trivia and icebreakers are run to encourage interaction between students; every second week there is a trip to the park – providing an opportunity for sport and play, and to be out in nature; meditation has recently added another dimension to student’s concept of a healthy lifestyle. Students report being less socially isolated, less anxious, more confident and having a sense of purpose. Miller describes the shift as most evident during the end of year exhibition and album launch, with students proudly showing family, friends and support workers how hard they’ve worked and what they’ve achieved. We know that approximately 83% of the young people who graduated in 2011 successfully entered a training or education program or employment; an impressive statistic – and important outcomes – but in a day dedicated to showcasing the transformations of so many young lives, The Museum of Contemporary Hearts will offer a comprehensive reflection on the history of CYI in terms of its full impact on direction of so many young lives. ◄ A New Face For Advocacy?